He's also going to be starring in your nightmares tonight. Stepping into the spotlight one by one, a new series of trailers have begun trickling through the intertubes promoting the impending release of the arcade brawler Teenage Mutant Ninja Turtles: Out of the Shadows. 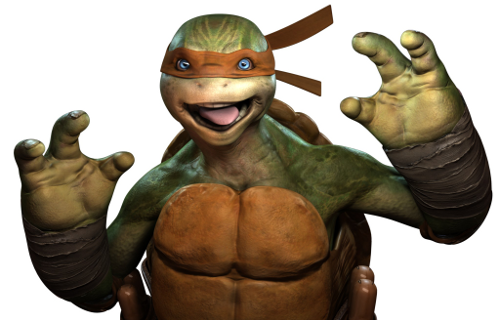 It starts with Michelangelo, who we already know "is a party dude". He also happens to be the youngest and fastest member of the turtle bunch. The trailer below shows off some of his moves, and the image above shows off his ability to induce nightmares. Always ready with a punch and a punchline, the orange-draped Michelangelo puts a literal spin on the phrase "party animal." He's a fun-loving foodie with an appetite for goofing off instead of training. But despite his lighthearted tone and distaste for confrontation, Mikey is no less committed to the cause than his older brothers, whom he looks up to as role models. And yeah, the turtles still look really strange (we're using our nice words, there), but the gameplay seems to be shaping up quite nicely. Sunken jawbones and creepy necks aside, Teenage Mutant Ninja Turtles: Out of the Shadows is scheduled for release this summer on Steam, Xbox Live Arcade, and PlayStation Network. It will support two player local and four player online co-op.